By default ICTBroadcast allow timezone based restriction on outbound calls / campaigns. 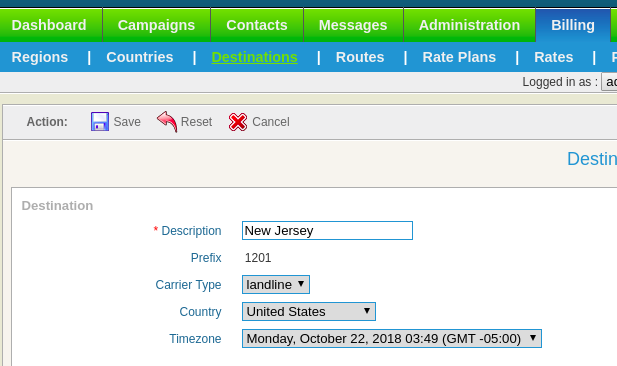 User are allowed to make outbound calls during the allocated timezone. This (the default) feature uses user's timezone to calculate allowed time slot. The new modification allows ICTBroadcast to use area code / destination timezone for time slot calculation. This allows ICTBroadcast to restrict calls based on both user and destination timezones. User have to maintain ICTBroadcast destinations. otherwise system can produce unwanted results, To update timezone for destination please visit Billing -> Destination and then edit all required destinations. and select appropriate timezone against each destination.